Thirty-six states and the District of Columbia currently limit entry or expansion of health care facilities through certificate-of-need (CON) programs. These programs prohibit health care providers from entering new markets or making changes to their existing capacity without first gaining the approval of state regulators. Since 1972, Michigan has been among the states that restrict the supply of health care in this way, with 18 devices and services—including acute hospital beds, magnetic resonance imaging (MRI) and positron emission tomography (PET) scanners—requiring a certificate of need from the state before the device may be purchased or the service offered. CON restrictions are in addition to the standard licensing and training requirements for medical professionals, but are neither designed nor intended to ensure public health or ensure that medical professionals have the necessary qualifications to do their jobs. Instead, CON laws are specifically designed to limit the supply of health care and are traditionally justified with the claim that they reduce and control health care costs. The theory is that by restricting market entry and expansion, states will reduce overinvestment in facilities and equipment. In addition, many states—including Michigan—justify CON programs as a way to cross-subsidize health care for the poor. Under these “charity care” requirements providers that receive a certificate of need are typically required to increase the amount of care they provide to the poor. These programs intend to create quid pro quo arrangements: state governments restrict competition, increasing the cost of health care for some, and in return medical providers use these contrived profits to increase the care they provide to the poor. However, these claimed benefits have failed to materialize as intended. Recent research by Thomas Stratmann and Jacob Russ demonstrates that there is no relationship between CON programs and increased access to health care for the poor. There are, however, serious consequences for continuing to enforce CON regulations. In particular, for Michigan these programs could mean approximately 12,982 fewer hospital beds, between 20 and 40 fewer hospitals offering MRI services, and between 68 and 85 fewer hospitals offering computed tomography (CT) scans. For those seeking quality health care throughout Michigan, this means less competition and fewer choices, without increased access to care for the poor. CON programs were first adopted by New York in 1964 as a way to strengthen regional health planning programs. Over the following 10 years, 23 other states adopted CON programs. Many of these programs were initiated as “Section 1122” programs, which were federally funded programs providing Medicare and Medicaid reimbursement for certain approved capital expenditures. Michigan enacted its first CON program in 1972, two years before the passage of the National Health Planning and Resources Development Act of 1974, which made certain federal funds contingent on the enactment of CON programs, and provided a strong incentive for the remaining states to implement CON programs. In the seven years following this mandate, nearly every state without a CON program took steps to adopt certificate-of-need statutes. By 1982 every state except Louisiana had some form of a CON program. In 1987, the federal government repealed its CON program mandate when the ineffectiveness of CON regulations as a cost-control measure became clear. Twelve states rapidly followed suit and repealed their certificate-of-need laws in the 1980s. By 2000, Indiana, North Dakota, and Pennsylvania had also repealed their CON programs. Since 2000, Wisconsin has been the only state to repeal its program. Michigan remains among the 36 states, along with the District of Columbia, that continue to limit entry and expansion within their respective health care markets through certificates of need. On average, states with CON programs regulate 14 different services, devices, and procedures. Michigan’s CON program currently regulates 18 different services, devices, and procedures, which is more than the national average. As figure 1 shows, Michigan’s certificate-of-need program ranks the 15th most restrictive in the United States. Note: Fourteen states either have no certificate-of-need laws or they are not in effect. 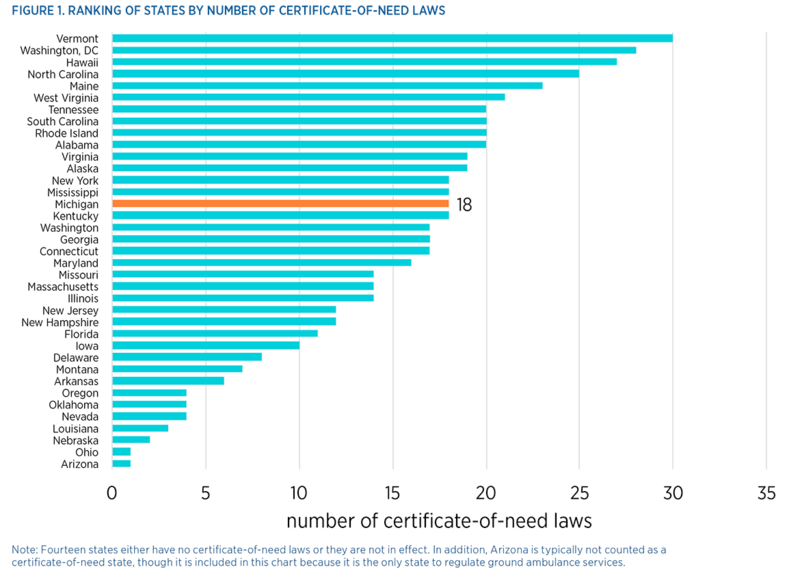 In addition, Arizona is typically not counted as a certificate-of-need state, though it is included in this chart because it is the only state to regulate ground ambulance services. Do CON Programs Control Costs and Increase the Poor’s Access to Care? Many early studies of CON programs found that these programs fail to reduce investment by hospitals. These early studies also found that the programs fail to control costs. Such findings contributed to the federal repeal of CON requirements. More recently, research into the effectiveness of remaining CON programs as a cost-control measure has been mixed. While some studies find that CON regulations may have some limited cost-control effect, others find that strict CON programs may in fact increase costs by 5 percent. The latter finding is not surprising, given that CON programs restrict competition and reduce the available supply of regulated services. The theory behind cross-subsidization through these programs is straightforward. By limiting the number of providers that can enter a particular practice and by limiting the expansion of incumbent providers, CON regulations effectively give a limited monopoly privilege to providers that receive approval in the form of a certificate of need. Approved providers are therefore able to charge higher prices than would be possible under truly competitive conditions. As a result, it is hoped that providers will use their enhanced profits to cover the losses from providing otherwise unprofitable, uncompensated care to the poor. Those who can pay are supposed to be charged higher prices to subsidize those who cannot. In reality, however, this cross-subsidization is not occurring. While early studies found some evidence of cross-subsidization among hospitals and nursing homes, the more recent academic literature does not show evidence of this cross-subsidy taking place. The most comprehensive empirical study to date, conducted by Thomas Stratmann and Jacob Russ, finds no relationship between certificates of need and the level of charity care. While certificates of need neither control costs nor increase charity care, they continue to have lasting effects on the provision of health care services both in Michigan and in the other states that continue to enforce them. However, these effects have largely come in the form of decreased availability of services and lower hospital capacity. In particular, Stratmann and Russ present several striking findings regarding the provision of health care in states implementing CON programs. First, CON programs are correlated with fewer hospital beds. Throughout the United States there are approximately 362 beds per 100,000 persons. However, in states such as Michigan that regulate acute hospital beds through their CON programs, Stratmann and Russ find 131 fewer beds per 100,000 persons. In the case of Michigan, with its population of approximately 9.9 million, this could mean about 12,982 fewer hospital beds throughout the state as a result of its CON program. Moreover, several basic health care services that are used for a variety of purposes are limited because of Michigan’s CON program. Across the United States, an average of six hospitals per 500,000 persons offer MRI services. In states such as Michigan that restrict hospitals’ capital expenditures (above a certain threshold) on MRI machines and other equipment, the number of hospitals that offer MRIs is reduced by between one and two per 500,000 persons. This could mean between 20 and 40 fewer hospitals offering MRI services throughout Michigan. The state’s CON program also affects the availability of CT services. While an average of nine hospitals per 500,000 persons offer CT scans, CON regulations are associated with a 37 percent decrease in these services. For Michigan, this could mean between 68 and 85 fewer hospitals offering CT scans. While CON programs were intended to limit the supply of health care services within a state, proponents claim that the limits were necessary to either control costs or increase the amount of charity care being provided. However, 40 years of evidence demonstrate that these programs do not achieve their intended outcomes, but rather decrease the supply and availability of health care services by limiting entry and competition. For policymakers in Michigan, this situation presents an opportunity to reverse course and open the market for greater entry, more competition, and ultimately more options for those seeking care.